Outcomes of wound healing: tissue regeneration or fibrosis. Following tissue injury, epithelial and/or endothelial cells release inflammatory mediators that initiate an antifibrinolytic-coagulation cascade, which triggers blood clot formation. This is followed by an inflammatory and proliferative phase, when leukocytes are recruited and then activated and induced to proliferate by chemokines and growth factors. The activated leukocytes secrete profibrotic cytokines such as IL-13 and TGF-β. Stimulated epithelial cells, endothelial cells, and myofibroblasts also produce MMPs, which disrupt the basement membrane, and additional cytokines and chemokines that recruit and activate neutrophils, macrophages, T cells, B cells, and eosinophils, important components of reparative tissue. The activated macrophages and neutrophils clean up tissue debris, dead cells, and invading organisms. Shortly after the initial inflammatory phase, myofibroblasts produce ECM components, and endothelial cells form new blood vessels. The myofibroblasts can be derived from local mesenchymal cells, recruited from the bone marrow (where they are known as fibrocytes), or derived by EMT. 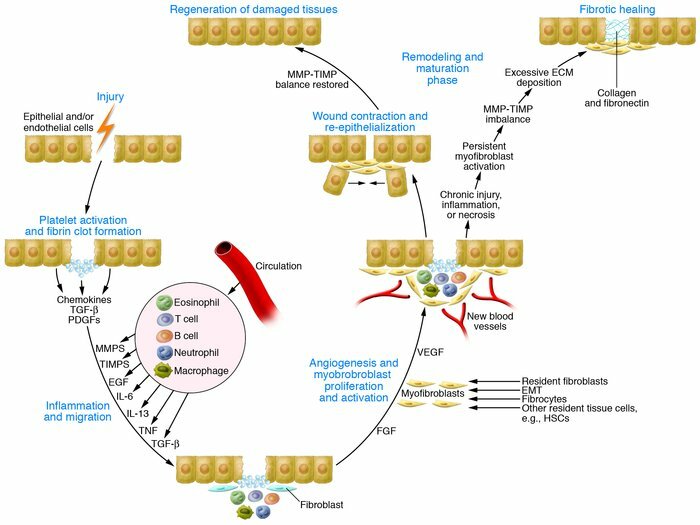 In the subsequent remodeling and maturation phase, the activated myofibroblasts stimulate wound contraction. Collagen fibers also become more organized, blood vessels are restored to normal, scar tissue is eliminated, and epithelial and/or endothelial cells divide and migrate over the basal layers to regenerate the epithelium or endothelium, respectively, restoring the damaged tissue to its normal appearance. However, in the case of chronic wounds, the normal healing process is disrupted. Persistent inflammation, tissue necrosis, and infection lead to chronic myofibroblast activation and excessive accumulation of ECM components, which promotes the formation of a permanent fibrotic scar.